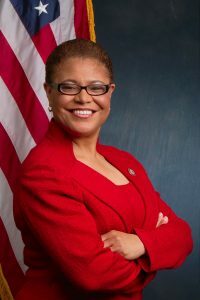 Congressmember Karen Bass MSW ’15, the first African-American woman to serve as leader of a state legislative body, U.S. Representative and Chair of the Congressional Black Caucus will deliver the commencement address for USC’s 136th commencement. Bass was sworn in to chair the Congressional Black Caucus in January and joined the U.S. Congress in 2011. A lifelong Angeleno and daughter of a U.S. postal worker, Bass served as an emergency room Physician Assistant at LAC+USC Medical Center early in her career. In 1990, Bass founded the Community Coalition, an organization that works to this day to transform the social and economic conditions in South Los Angeles that foster addiction, crime, violence, and poverty by building a community institution that involves thousands in creating, influencing and changing public policy. In 2005, she was elected to represent parts of Los Angeles in the State Assembly. During her third term there, Bass became the first-ever African-American woman to be elected leader of any state legislative body. In the aftermath of the 2008 economic recession and budget crisis, Bass’ bipartisan negotiation efforts earned her the John F. Kennedy Profile in Courage Award. Bass has represented California’s 37th Congressional District, which includes the University Park Campus, in Washington, D.C. since 2011. In addition to chairing the 55-member Black Caucus, Bass has served on the Foreign Affairs, Judiciary, and Budget committees and currently chairs both the House Foreign Affairs Subcommittee on Africa, Global Health, Global Human Rights and International Organizations in addition to the House Judiciary Subcommittee on Crime, Terrorism, and Homeland Security.